Located at the mouth of Tampa Bay, Egmont Key is now primarily a wildlife refuge. Accessible only by private boat, it has a unique natural and cultural history, including a lighthouse that’s stood since 1858. On any given day you’ll find boating, swimming and fishing activities going on around this small island; often oblivious to the decades of history. Although its outward appearance deceives the average observer, take a moment and travel back to the beginning. This modest island located at the entrance to Tampa Bay played a dynamic part in the area’s history. Named in honor of John Perceval, the second Earl of Egmont, it witnessed the passing of Spanish Conquistadors, English, and Spanish Privateers, the violent struggle between brothers in blue and grey and later ships of steam and iron. Today hundreds of steel hulled, oil driven, satellite guided ships pass this small island, on course to Tampa. Throughout the early 1830’s as Tampa developed into an active seaport, so did the number of shallow water groundings near Egmont Key. To remedy the situation local citizens petitioned the Government to construct a lighthouse at the entrance to Tampa bay. In March 1848 Congress authorized $7,050.00 to erect the only lighthouse between St. Marks and Key West. Living on the island with his family, the first lighthouse tender, Sherrod Edwards operated the new beacon. Shortly after completion, the great hurricane of 1848 struck Florida’s gulf coast. As a result, enormous tidal surges completely covered the island. Before the storm; Edwards placed his family in a small boat and tied it to cabbage palms at the highest point on the island. There they rode out the violent storm. By morning the exhausted family returned to the lighthouse finding it severely damaged and their possessions gone or destroyed. As the powerful storm passed and the winds and seas subsided; Edwards again loaded his family into the boat, rowed to shore and resigned his post as lighthouse tender. In what is generally called today’s hurricane season; subsequent storms followed and also, wreaked destruction on the island and lighthouse. Once again, Congress came to the rescue and appropriated monies to redesign and rebuild the lighthouse to withstand future storms. The new 120 foot lighthouse was fitted with a “Fresnel Lens” and “Argard Lamp,” the most modern and newest equipment of its time. As a tribute to the builders this structure still stands today. This small island added a dreadful footnote to the Seminole Indian Wars. Egmont served as a holding area, and point of departure, for hundreds of Seminoles awaiting transportation to a reservation in Arkansas. As the final Indian War came to a close in 1858, a tragic event took place on tiny island. The last remaining chief in South Florida; Billy Bowlegs surrendered in Fort Myers with his remaining followers. For their final rendezvous before crossing the Gulf of Mexico they were transported to the holding facility at Egmont Key. Shortly, before boarding a transport ship and unable endure the humility of being taken from his native Florida. A proud warrior named Tiger Tail committed suicide by grinding up pieces of glass and swallowing it with a glass of water. His suicide tragically ended an era of Indian Wars in Florida. In 1861, the deadliest Civil War in U.S. history commenced. Confederate troops decided to occupy this strategic location, but quickly realized they were unable to defend its location. Making preparations to leave, they decided to render the lighthouse useless, and took the Fresnel lens during the evacuation. Despite the inoperable light beacon, Union Forces captured the island in November 1861 and established a Union gunboat base. These boats successfully blockaded the entrance to Tampa Bay and shelled buildings of military importance, around the bay. At one point they even invaded and briefly occupied Tampa. Before the war ended, with the surrender of General Robert E. Lee in 1865, thousands of run-away slaves, Union sympathizers, and Confederate prisoners were held captive on the small isolated island. As the war subsided, new lighthouse keepers were hired to live on the island. They were responsible for day to day operations involving general house keeping, lens cleaning, and wick trimming. When the U.S. Lighthouse Service established a sea buoy depot and coal shed in 1872; the small history filled island finally seemed destined to some normality, but not for long. In 1898, irresolvable differences over the liberation of Cuba loomed on the horizon, between the United States and Spain. The Spanish-American War seemed inevitable and apprehension ran high for the citizens of Tampa. Concerned over a Spanish fleet invasion, they demanded the government intervene and establish some kind of security guarding the entrance to Tampa Bay. In 1906 an Army Fort was completed for an invasion that never came to pass. Never the less, the mighty fort, named in honor of Army Major Francis Dade stood ready to guard Tampa Bay. Fort Dade soon became a sprawling island town. Complete with post office, Movie Theater, electric lights, telephone service, sewers, icehouse, and hospital; it even had an elementary school. Nearing the 20th century, a fort that proudly served even during the World Wars was finally decommissioned in 1923. Now the once proud fortress succumbs to years of abandonment and pounding surf. Much of the original fort and buildings located 250 yards inland are literally crumbling into the sea. In 1939 lighthouse operations was transferred to and are now maintained by the U.S. Coast Guard. In the 1940’s the lighthouse was modernized by adding two 200,000 candle power airport beacons visible to 28 miles offshore. When the original beacon was removed; to accommodate the modern lights the tower was shortened to 85 feet. The Tampa Bay Pilots Association was founded in 1886, to help guide merchant ships into Tampa. Today, their presence on Egmont Key is a living statement to Tampa’s maritime history. Egmont Key State Park and National Wildlife Refuge – was established in 1974 and protects a diverse community of animals and plants, many of which are either threatened or endangered. 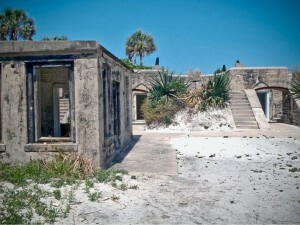 This island refuge was once the site of the former United States Army Fort Dade Military Reservation, and abundant reminders of this unique military past can be found scattered throughout the island today. Silent gun batteries testify to a time when mighty battleships reigned supreme on the world’s oceans. Anyone with interest in Tampa history or ghost towns should visit Egmont Key State Park that’s open 365 days from 8 AM until sundown.